Food is a mutual passion between us. One bite of a dish can transport you to a different country, help you recall a buried memory, and soothe your soul. But I believe, and I think you will agree with me, that food’s greatest power lies in its ability to connect different people – even complete strangers – together. When you share food with someone, there are deep biological and cultural implications behind that act that go beyond offering that person a physical item; the meaning extends into offering sustenance for life, a welcome into one’s culture and an opportunity to start a new relationship. 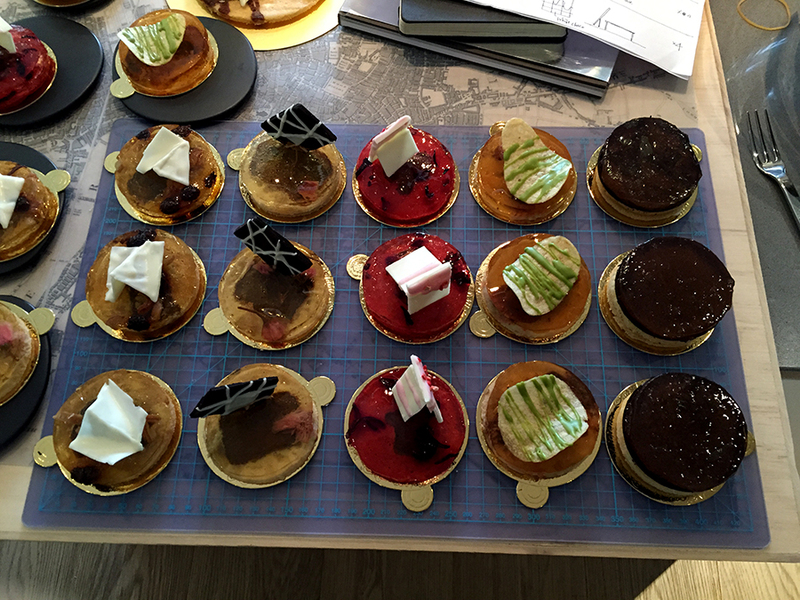 Today, my team and I wish to share our food from the RIBA HK Chapter EAT! 2015 Competition with you, and we hope you will enjoy the taste of our culture of architecture. For this competition, we drew inspiration from the 2012 Serpentine Gallery Pavilion by Herzog & Ai Wei-wei. Extricating the architectural flavours, textures and visual presentations from the pavilions, we created bite-sized desserts to represent each one. By recreating the pavilions with food, the goal of our approach was to make architecture more comprehensible to the public by connecting architecture with something that has universal appeal and innate significances. Like chefs, architects also “cook” – using only different ingredients. But for this competition, we had the pleasure of actually cooking with the same ingredients. In an imitation of the geometries of the pavilions’ foundations, we produced miniature pancakes to act as the base of the desserts. Each pancake was spiced with a tea flavour to complement its gentle sweetness and for a reminiscence of British tea parties. A translucent layer of gelatin, flavoured with the local ingredients of the corresponding architect’s nationality, laid on top of the pancake base. An identifiable architectural expression, a nod to the defining visual feature of each pavilion, topped the dessert off. Finally, all ten dessert pavilions were served in a hot iron pan on a bed of melted marshmallows, symbolizing the bodies of water by the 2012 Serpentine Pavilions. Relating pavilions, a historic architectural form, to food, we hoped that people could see that the culture of architecture possesses subtle, meaningful implications like food: it is designed to sustain human life, a phenomenon unique to each culture and a space that facilitates social interaction. As a fellow appreciator of fine arts and foods, I hope you will cherish the taste of architecture as well!